Last Friday I was in the city for a Christmas event for a department within a major international financial institute. We had two ribs for the group for their Thames Power Blast and although numbers had slightly reduced the group decided to stick with the two ribs and make the most of the Thames Blast. As it was a Christmas Thames Power Blast the group also enjoyed Christmas hats, Christmas music while on the ribs and mulled wine on their way back, which I am sure they really needed as it was a very cold day. 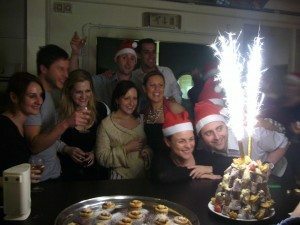 The group had a brilliant time and went on to enjoy the rest of the Christmas Party with a meal and drinks in London. attending our Christmas Cocktail Party in the City and tomorrow we have a Christmas Cooking event for a very large international company. There is still time to book any last minute Christmas Parties if you have left it very last minute and are looking to arrange something for your group please contact us. At the moment we are also taking a lot of booking for the Rugby Six Nations 2010, we have many different packages to offer at very competitive prices and if you are interested please contact us. We are also getting quite a few enquires for Team Building in the new year, if you are looking to arrange a team building event we have a very large range of different team building events that work very well as a add on to a conference or as a standalone event. Please contact us for more information. The run up to Christmas….